Sometimes when you see a cookbook you know you have to have it. That was the case on a recent trip to Galway to stay with the Schoolfriend. The Husband, Little Missy and I stopped off for a Very Nice Lunch at Claire’s Tearooms in Clarinbridge, which is also beloved by Gillian at Chocolate Here for its proper china teacups and saucers, great quiches and indulgent baking. I have a weakness for tea rooms at any time and Claire’s has always been the perfect stop off after a long trip. Unfortunately for the Husband who wanted to get moving again, I discovered that the legendary Charlie Byrne’s have now opened a small bookshop upstairs, with cookbooks both old and new on offer. 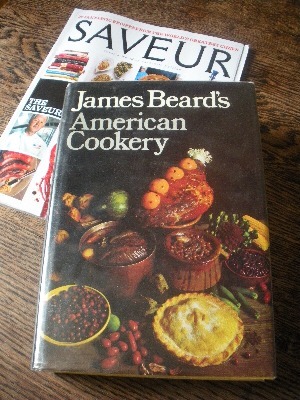 I was restrained (both by the Husband’s hovering and my own purse) so I just grabbed or, rather, hefted – this is not a small book – this copy of James Beard’s American Cookery which was published in 1974. What with all the reading in the car on the way home I had already figured out that American Cookery was a very worthy addition to the kitchen bookshelves. I laughed then to discover it featured in my most recently arrived copy of Saveur as part of The Saveur 100. Sometimes it’s good to grab cookbooks on impulse. You’re so on trend! 🙂 I’m intrigued by the sugar pie you mentioned here, I’ve never heard of it! I wouldn’t exactly say that – more that once you get an old cookbook you notice mentions of it everywhere! Sugar Pie, also called Maple Syrup Pie or Tyler Pie, sounds almost tooth-jarringly sweet. It’s filled with 1 1/2 cups of sugar in a custard base. Think I might skip to the Frangipani Pie, which is next on the page. or to his pumpkin pie which is the best. Must try that one! Unfortunately someone – not me – packed American Cookery since I posted this so I’ll have to wait till it comes out of storage now. I do love me old cookbooks. Nothing nicer or cooler then finding stuff from the old days at car boot sales and the rest! Once you get through all the bloomin’ microwave books! There seems to be a real glut of those for sale in every secondhand book pile. That is SOOOO true, it was such a craze when they came in first. Even Irish publishers did some. My favourite to look through but not buy though are the Freezer Cookbooks! PS: You’ve inspired me to post some images of old cookbooks, in fact to start a little series!